A bench headed by Chief Justice Dipak Misra said it would hear the plea tomorrow as Additional Solicitor General Tushar Mehta, who represents the CBI, was unavailable due to some personal reasons. New Delhi: Karti Chidambaram, son of former Union Minister P Chidambaram, today told the Supreme Court he wants to visit the United Kingdom to get her daughter admitted at the Cambridge University and was willing to undertake that he would not visit any bank there. "He wants to go to the Cambridge to get his daughter admitted. He is willing to give an undertaking that he will not visit any bank there," senior lawyer Kapil Sibal, appearing for Mr Karti, told the bench that also comprised Justices AM Khanwilkar and DY Chandrachud. 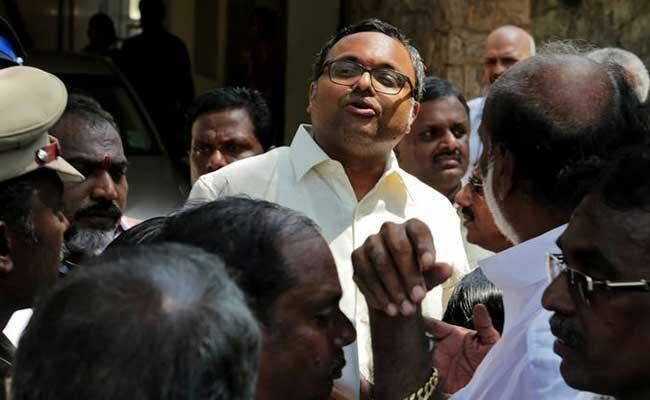 The top court has stayed the Madras High Court order, which had stayed the operation of the lookout circulars (LOCs) issued against Mr Karti and others in the case. The CBI FIR, lodged on May 15, had alleged irregularities in Foreign Investment Promotion Board (FIPB) clearance to INX Media for receiving overseas funds to the tune of Rs 305 crore in 2007 when Mr Karti's father was the Finance Minister. In response to CBI's allegation that Mr Karti had multiple bank accounts abroad, Mr Sibal said Mr Karti has one bank account in the UK. On October 4, the CBI had alleged in the top court that Mr Karti had "tampered" with evidence relating to an alleged graft case against him during his visits abroad in the months of May, June and July this year. The agency had said that there was a need to issue a LoC against Mr Karti as he had the "potential" to tamper with the evidence and he had done this during his visits abroad. CBI had last month told the apex court that Mr Karti was prevented from travelling abroad as he was allegedly closing several of his foreign bank accounts. The CBI's contention was strongly refuted by Mr Karti's counsel. The top court is hearing CBI's appeal challenging Madras High Court order staying the government's LOC against Mr Karti in the alleged graft case. On September 1, the CBI had told the top court that there were "good, cogent" reasons for issuing the LoC against Mr Karti. On August 18, the court had asked Mr Karti to appear before the investigating officer at the CBI headquarters here for questioning in the case. Before this, the top court had said that Mr Karti would not be allowed to leave India without subjecting himself to investigation in the case. The court had then stayed the high court order putting on hold the LOC against Mr Karti. The FIR was registered on May 15 before the special CBI judge here and the registration of the case was followed by searches at the residences and offices of Mr Karti and his friends the very next day.